The Grand Classic Series epitomizes the peak in timpani performance. Customize your ideal instrument through choices of hammering density, pedal system, head type, and configuration. Berlin (Ringer) with Clutch pedal system and hand operated fine tuner. The Symphonic Grand Series combines the stability of a block pedal with both traditional hand operated and foot operated fine-tuners. The resulting instrument offers greater accessibility to professional level tuning mechanics. The Symphonic Grand Stand Series also available without hand and foot fine-tuner. 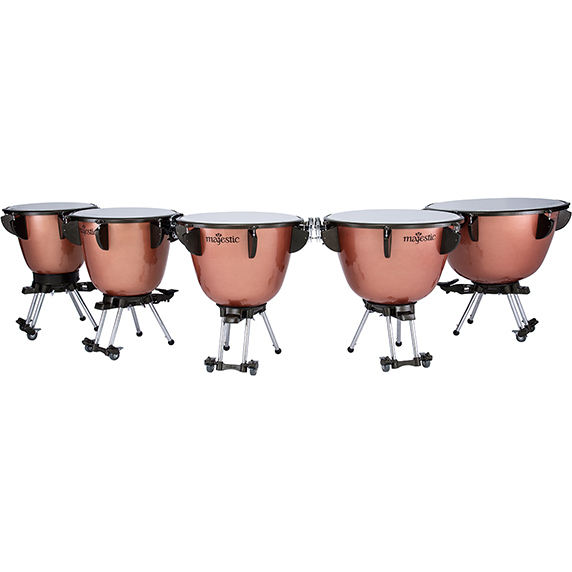 From stage to car in simple steps, innovative Prophonic timpani place the superior sound of fully suspended cambered copper or aluminum kettles on an elegant portable frame. Balance style pedal system, easy to operate. The Majestic Concert series timpani offer lightweight portability and an extended range of height adjustment. Making them ideal for promoting good technique to young players. Spring assisted Block style pedal system. Retractable legs for an extended range of height adjustment; fully collapsible pedal and retractable legs for ease of transportation. Polished Copper or specially formed FRP (fiberglass) or aluminum kettles in a low profile suspension frame produce a clear, pure tone. The combination of tone quality and pedal stability make it the ultimate school instrument. As popular with traveling professionals as it is with music educators , the Harmonic series offers performance, precision and stability like no other portable timpani.